Catherine Schimenti, Pastry Chef/Owner Baked by the Ocean, Long Beach, N.Y.
2. Add the flour and ground pinenuts. 3. Roll dough 1/4-inch thick. 4. Chill dough, set in a 1/4 sheet tray. 5. Bake until golden and allow to cool. 1. Whisk the dry ingredients together, slowly add the Passion Fruit Concentrate and lime zest. 2. Then add the salt and eggs 1×1. 3. Strain the liquid and pour into tart shells. 5. 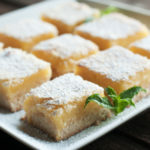 Chill, cut into bars and dust top with powdered sugar.